This week I'm looking at the usability, depth and quality of news coverage of the Tour De France on the internet. The obvious place to start my tour of Tour De France website coverage, is with the official site of the race itself - letour.fr. During the course of a stage, the homepage turns into one giant web dashboard of stats, facts, figures and news. There is a graphic indicating the profile of the stage being raced, with an indicator of where the leaders currently are, and minute-by-minute news coverage. This is rather more serious and factual than some of the minute-by-minute coverage that we see being provided by other news outlets - but then they are having to do it simultaneously in all four languages of the site. After each stage is completed, the site features a 'Film of the stage', which, contrary to what the name suggests, isn't actually video content at all. Instead it is a rather official and prosaic description of what happened, with transcriptions of the post race comments from the leading cyclists. The team of the yellow jersey controlled the peloton’s pursuit of the five escapees. The points for the 2nd intermediate sprint were won by the same trio as the first - Millar, Grivko, Kuschynski. Their quintet was 5'05" ahead of the peloton at the 76km mark. There was a crash in the peloton involving Gonzalo Ramirez (AGR) who was forced to abandon. The average speed for the 2nd hour was 40.1km/h. The points for the 1st climb were won by: Millar, Grivko, Kuschynski. The peloton was at 4'40". There is a photo gallery for each stage of the race, which features all of the official podium pictures from the jersey presentations, and also veers from some great action shots to some of the more quirky images generated by the Tour De France. There are no RSS feeds from the site which is a real shame, and there is no user-generated content area. My main reservation about the site is the extensive use of Flash to deliver the content. I can't help feeling that, rather like UEFA, the organisers of the Tour De France got seduced by a glitzy web agency pitch of how exciting and multimedia the site could be, which was demonstrated over a really fat and fast LAN connection. At home for me however, with my reliance on Greek dial-up speeds - which are never going to win any kind of time trial - the site is very slow-loading, the video content is unavailable due to my very low bandwidth, and the site becomes virtually unusable. Tomorrow I'll be looking at the efforts of the BBC Sport website to cover Le Tour. 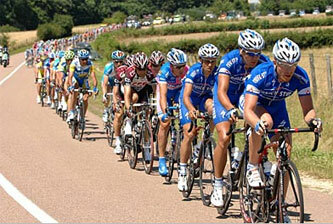 This post is one of a series looking at online coverage of the 2007 Tour De France. 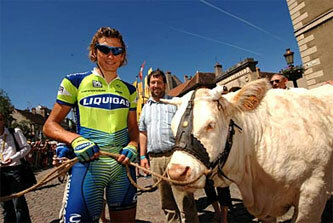 The news sources I looked at included the offical LeTour.fr site, the Yahoo! / Eurosport portal, The Guardian , The Telegraph, France 24, BBC Sport, CNN, The Independent and The Times. The series of posts started with a Prologue about my interest in the race, and finished with a Général Classement illustrating the features of the sites that I looked at. By Martin Belam on 23 July 2007. Hi Martin, race fans can get everything they need from the Tour site, but must admit it doesn't get cosy with its audience. They have looked to put videos on YouTube which is a smart idea. And I've seen Twitter being used to report from the races. I'm looking forward to this collection of articles. I think letour.fr works quite well, and the slightly stulted (have I just made that word up? I think I might) commentary is due to a cack-handed translator more than anything else.